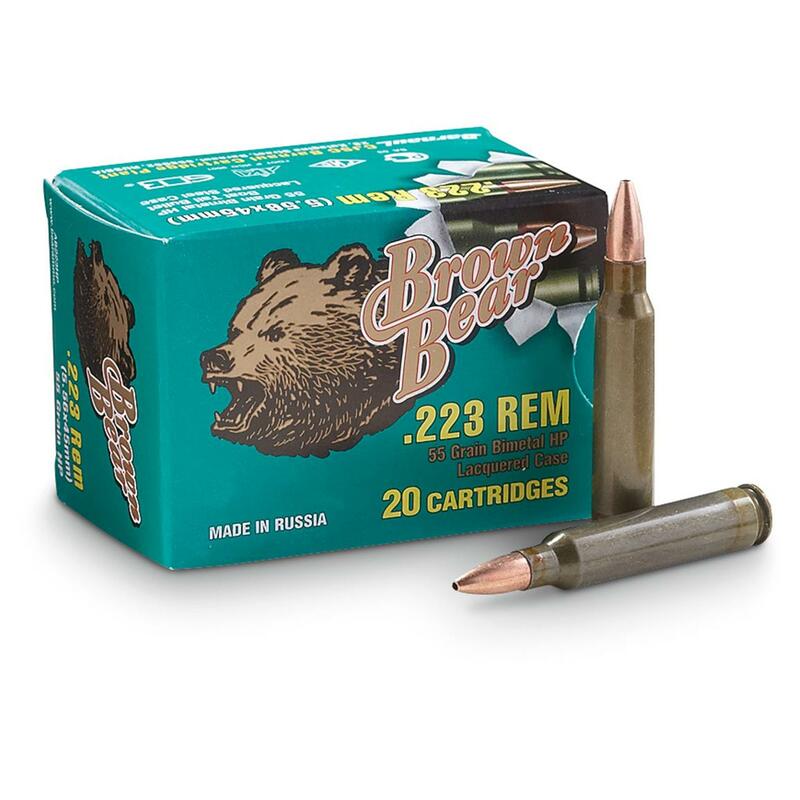 Brown Bear® .223 Rem 55 Grain Hollow-Point Ammo. This high quality Ammo features a lacquered steel case; hence the "Brown" Bear name. Loaded to exacting standards normally reserved for military specification ammo. Muzzle velocity: 3,241 F.P.S. Muzzle energy: 1,282 ft.-lbs. Size: 5.56x45mm. Note: Please check your gun manual to ensure it is recommended to shoot 5.56x45mm ammunition. This is a higher pressure round. 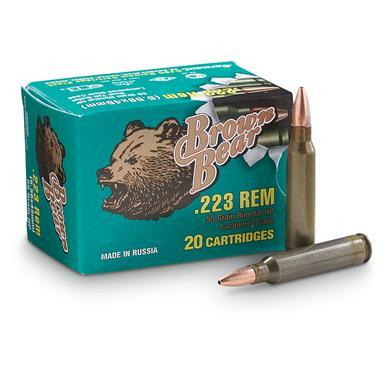 Brown Bear, .223 Rem, HP, 55 Grain, 260 Rounds is rated 4.9 out of 5 by 17. Rated 5 out of 5 by Steve841 from Gret Price and Very Good Ammo I recently became the proud owner of an AR 15 and needed some ammo. A friend told me about Brown Bear and I started searching. Sportsmans Guide had the best price so I ordered 260 rounds. I fired 150 the first time out and the ammo was flawless. No jambs and wasn't very dirty at all. Easy cleanup afterwards. I'll definitlely be re-ordering soon. Rated 5 out of 5 by Chris from Good Product These rounds are very accurate for the price. I can put 5 shots in a 3 inch circle at 200 yards. After running about 40 rounds there was no FTF or FTE. My intentions were to use these for coyotes, have not got the opportunity to shoot one yet. I have not had an corrosion issues with the steel case and all the primers are set correctly. The reason I went with the brown bear HP was because they are slightly cheaper than silver bear and available. Overall, I am very happy with the product and will continue to buy these as plinking ammo and for general hunting. Rated 5 out of 5 by Excel4Ever from Good ammo! This ammo performs very well. I have had no misfires whatsoever. The price allows me to fire frequently on the range. SG has consistently delivered quality products in a timely manner. Keep up the good work SG! Rated 4 out of 5 by fireglider from Great general purpose ammo. Fine ammo for target practice or varmit hunting. Great price! Rated 5 out of 5 by JOHN from Have heard a lot of bad comments concerning this type of ammo and jamming. I have not had this problem. My friends and I shot several hundred rounds through three different AR15's and CAR15's with no problems.